Porsche, the German sports car brand in India has once again stunned everyone with the upgraded avatar of Porsche Panamera. Sensing the developing buzz for sports cars in India, the auto-giant has launched the updated version of the sports car in the Indian car market. This Volkswagen Group subsidiary unit has been consistently focusing on expanding its roots in the Indian subcontinent and so far it has been able to reach top cities of India – Ahemedabad, Bengaluru, Chandigarh, Gurgaon, Hyderabad, Kolkata and Mumbai. Considering the demand for the Diesel in-lined vehicles in India, the launch of Porsche Panamera Diesel is very significant. Hopefully, this second generation model with the fitted powerful diesel engine beneath its chassis will propel the sales of this car. Getting superb aerodynamics from the German state-of-art, the Panamera gets a focusing stance. Even the interiors go with the perfect match up of the exteriors availing utmost comforts through this four seater sports car. Blended well with iconic Porsche graphics and trims of a sports machine, the Panamera is a winking beauty in every sense ensuring peak performance through the recognized power-trains. The diesel one is very special and its efficiency is speechless. Porsche Panamera Diesel is available on the shores at the price tag of Rs. 1.23 Crore (Ex-showroom Delhi). The revamped Panamera carries perfect graphics that showcase the excellence of the company. It is the metal part that looks more than the glasses and the ORVMs are raised up a little. The muscles across the sides and the hood make it athletic to run with style on the roads. Head lights placed perfectly into the hood area makes it dynamically aggressive and the sleek bumpers with big air dams make the profile more attractive. Other featuring components at the front are the innovative fog lights along with LED indicators . The side gets the ultimate combination of alloy rim and broad wheels to stabilize the drive. Even the B-pillar surrounded by chrome leaves a long lasting impression on the onlookers. At the rear too, the sportiness continues and the unique tail lamps are breathtaking. The interior of Porsche Panamera Diesel is a different world with a spotless match-up of comfort and luxury. For the four occupants, the cabins have been designed well creating sufficient space with proper leg-room, head-room and shoulder width . The best part is the availability of varied options for the interior trims in 7 colours and 7 dual tone combinations. Even the gear shift knob with chrome around is an interesting feature and it gets rightly place between the two front seats. The centre console gets embossed with leather and so is the steering wheel. The dashboard is the best one from the car maker and even the instrument cluster design gives a sporty feel. The diesel powered Porsche Panamera gets the 3.0-litre turbocharged V6 diesel engine doped with variable turbine geometry efficiency. This impeccable engine churns out peak power of 250bhp at 3800 – 4400rpm and peak torque of 550Nm at 1750 – 2750rpm. This efficient engine comes mated to an eight speed tiptronic S transmission. Other than this, the efficient diesel mill of Panamera allows it to clock the speed mark of 0 – 100 kmph in a mere time span of 6.8 seconds with its top speed being 242kmph. 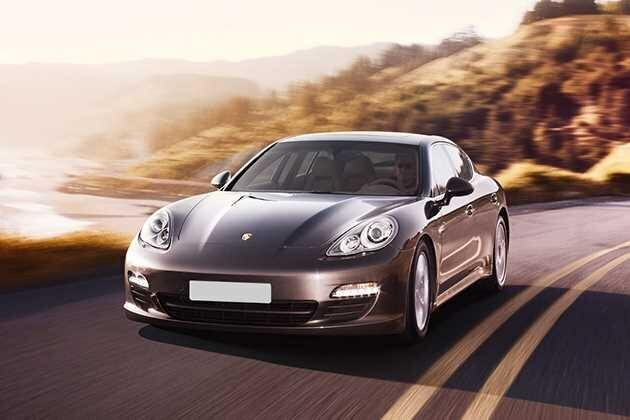 Porsche Panamera is a well-known product across the globe for its amazing stopping skills and balancing. Its second generation too comes blessed with same qualities that are due to the six piston aluminium monobloc fixed clippers present both at the front and rear. Even its light weight structure enables it to brake immediately as and when required. Besides this, the added drum disc brakes in ventilated grooves support the braking and control. This 2ndgeneration Panamera exhibits superb braking potential with all the necessary elements present in the car to control it in a better way. Moreover, the broad long tyres present in the vehicle ensures commendable road grip. Also the power steering is quite responsive and works well with the speed. There is no shortage of comfort and convenience features in the newly launched Panamera Diesel and it gets Power adjustable front seats with heating ventilation function, Smooth finish leather, Front and rear cup-holders, Glove compartment, Front footwell lights, Reading lights, Automatic climate control with zonal regulation, Active carbon filter , Electric roll-up sunblinds, Multi-functional steering wheel, ParkAssist, Porsche Entry & Drive, 445 litres luggage compartment, CDR audio system, Porsche communication management, Telephone module & mobile phone preparation, Bose surround system and many more. The company has taken care well of its passengers and has blessed the Panamera diesel with wide range of safety features that include – Porsche stability management (PSM), Bi-Xenon headlamps , Daytime running lights, Active bonnet system, Airbags, Porsche Side impact protection system, Anti-theft protection etc. Pros : Excellent braking, decent power, lots of exciting features, superb exteriors and lavish interiors. Cons : Too pricy, considering the demands of the Indian premium car buyers.